Illyria the acclaimed profesisonal theatre company is returning to the Festival, as the Grappenhall Walled Gardens will once more host open air theatre at its best. Bring your own picnic, seating and enjoy one of Shakespeare’s classics! The Tempest is a tragic comedy, and as is expected in Shakespere’s plots, there is high drama and humour. The tale begins as Alonso, the king of Naples, is returning from his daughter’s wedding in Tunis. The ship is wrecked and all the passengers and crew are thrown into the furious sea whipped up in a storm creted by Prospero. And so begins the complex twists and turns which have had audiences delighted since 1511. Note: this is a very popular event with limited tickets available so early booking is recommended when tickets go on sale 10am Friday 7th June, to avoid disappointment. Doors open at 6pm. Bring your own seating and a picnic. This event is not suitable for children under 10. Thank you to Spire Cheshire Hospital for sponsoring this event. Here’s how to find Grappenhall Walled Garden, WA4 3EA. 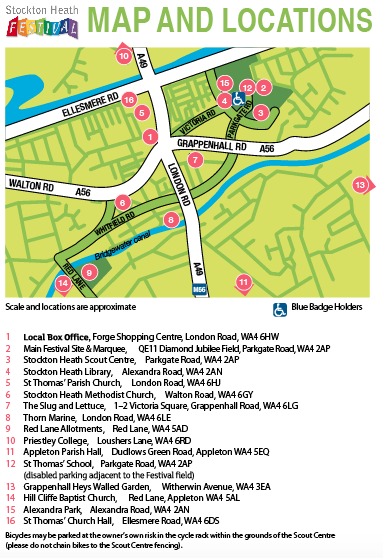 Here is a map showing venues around the Village, including blue badge parking.